Do you prefer to stay at a luxury all-inclusive resort, a budget hotel, or in a private condo? 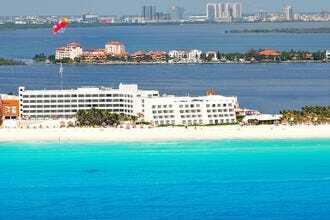 Regardless of your preference, you are sure to find what you are looking for in Cancun's world famous Hotel Zone. This 14-mile strip of land that is home to resorts, hotels, condos, shopping malls, nightclubs, restaurants and gorgeous white sand beaches, holds treasured memories for millions of tourists from around the world. 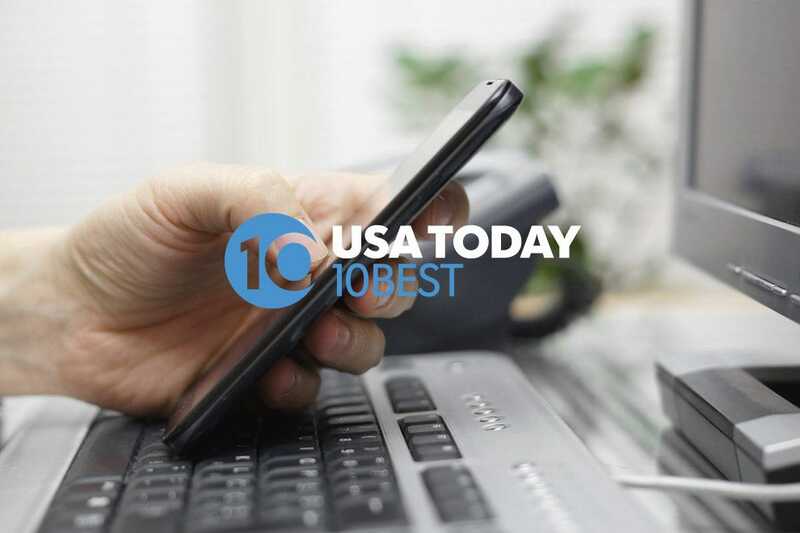 The hotel you stay in will be a very important part of your vacation, so it's important to do your research in order to find the perfect resort. 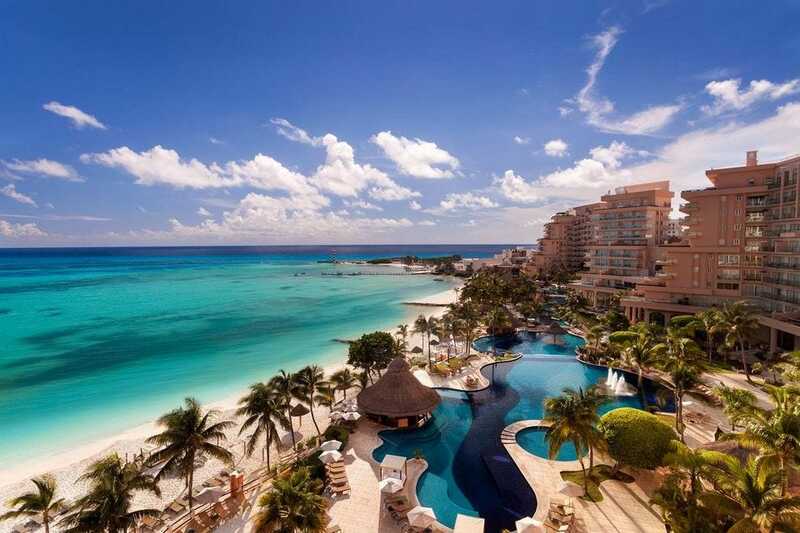 Cancun's Hotel Zone offers private homes and condos as well as nearly 100 hotels, ranging from budget properties on the lagoon to luxurious all-inclusive resorts overlooking the turquoise Caribbean Sea. 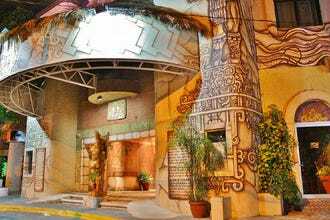 Lodging can also be found in downtown Cancun (known as “El Centro”), Puerto Juarez and on Playa Mujeres. Puerto Juarez and Playa Mujeres are out of the way and are popular areas for travelers that like to avoid crowds and hustle & bustle while on vacation. Downtown Cancun is great for people that want to get a taste of local life, stay near local shops and eateries, and not break the bank. Dining out is also generally less expensive in downtown Cancun than in the Hotel Zone. This upscale resort is great for families, couples, or singles. The pool area is lovely, the rooms are well-appointed & nicely decorated, and the staff is outgoing and attentive. All guest rooms and suites have an ocean view. Guests that book a room or suite on the club level will have access to the hotel's exclusive Club 91, where they can enjoy a complimentary breakfast buffet each morning, as well as complimentary cocktails, non-alcoholic beverages, and snacks that are provided throughout the day. In addition to the bars, restaurants, and delis at JW Marriott, guests also have access to the restaurants and bars at Marriott CasaMagna, the hotel's sister property, located right next door. If romance and relaxation are what you're looking for, you'll find both at Excellence Riviera Cancun. Located on a white sand beach just 20 minutes from Cancun's International Airport, this adult-only, all-inclusive, all-suite resort, which is immaculate and impeccably maintained, features 6 swimming pools, 8 international restaurants (no reservations required) including Italian, Asian, Mexican, Indian, French and American, a nightclub, a spa, a fitness center, and a culture of hospitality and service. 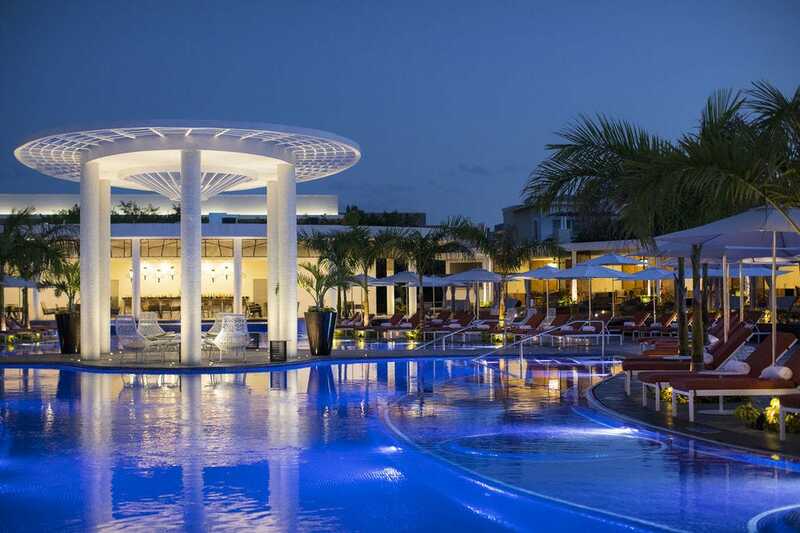 In addition, Excellence Riviera Cancun boasts nightly entertainment, has a friendly staff, and is one of the Cancun area's most popular adult-only resorts. Fiesta Americana Condesa Cancun All Inclusive is located in Cancun's Hotel Zone on one of the best beaches in the area. This recently renovated resort hasn't always been all-inclusive, but the change has not affected quality or service. 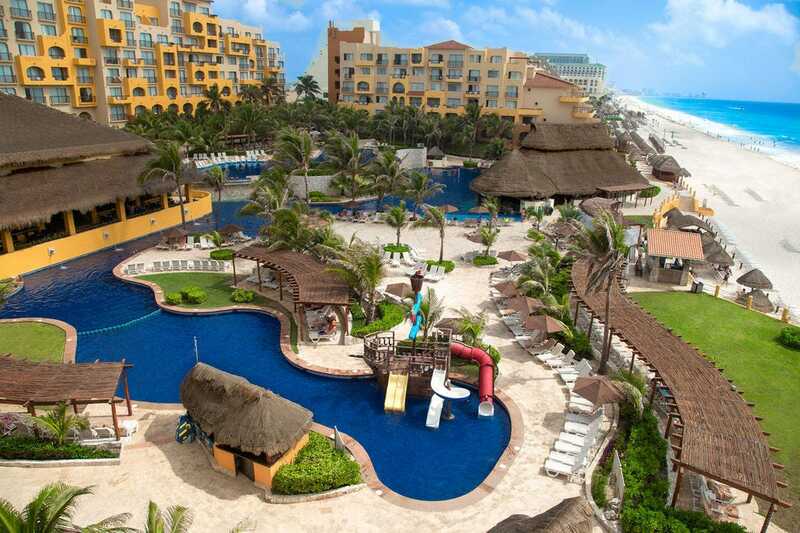 The food is downright delicious for an all-inclusive hotel and there are 14 restaurants and snack areas to chose from. Reservations are only needed for one restaurant. There is also a deli in the gift shop. With 8 different types of guest rooms, the resort also offers a kids club, teens club, daily and nightly entertainment, a gym, a full service spa, free WiFi, three pools, one with a swim-up pool bar, and a pirate ship in the children's pool. Luxury and elegance are the first two words that come to mind, when thinking about this upscale resort. The Ritz-Carlton name has long been synonymous with luxury and guests are not disappointed when they arrive at The Ritz-Carlton, Cancun. 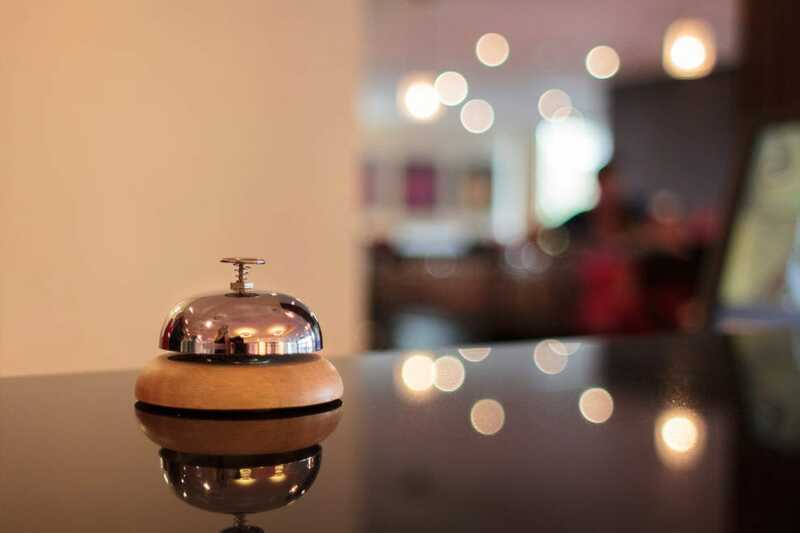 The incredibly attentive, personalized service begins the moment you walk in the front door and the staff will continue to wow you throughout your entire stay. Each guest room has a view of the Caribbean Sea and the hotel has two award-winning restaurants on-site, The Club Grill and Fantino. The Kayanta Spa is small, compared to spas in other area hotels of this caliber, but the selection of treatments and expertise of the therapists & technicians make this well-appointed facility a winner. 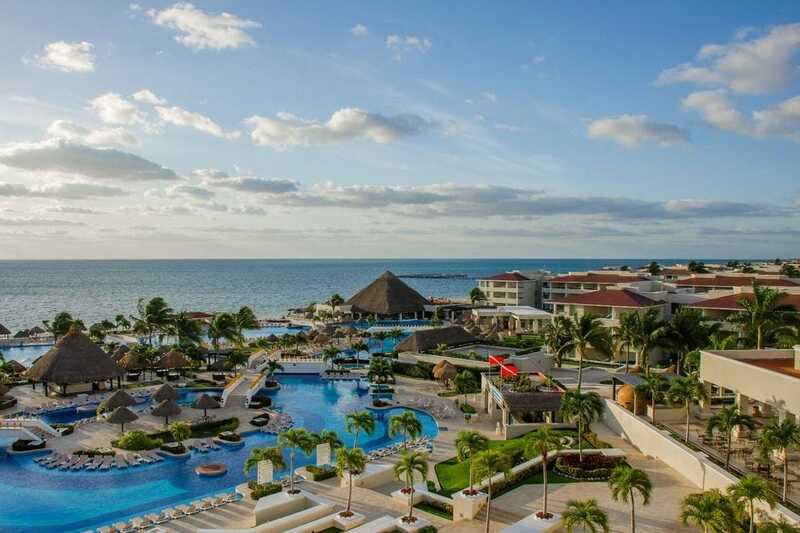 The Hard Rock Hotel Riviera Maya, located about an hour south of Cancun in Puerto Aventuras, is in a word, spectacular. With sprawling grounds, and two sections, one for the entire family and "Heaven", for adults only, anyone and everyone can party at the Hard Rock. For the youngest guests the resort's kids club, Little Big Club, provides engaging activites all day long. For big kids, there are eight bars & lounges, daily and nightly entertainment, the Rock Spa, Body Rock gym and countless other amenities. The resort often hosts rockin' special events and shows. The beach is breathtaking and located in a protected cove where guests can kayak and snorkel. These and all activites, shows, meals, drinks, an in-room mini bar and liquor dispenser are all included in the price of your stay, so by all means, go ahead and party like a rock star. 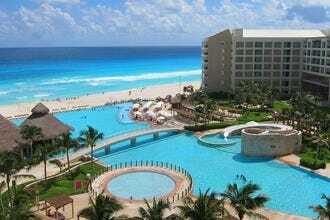 Note: There is also a Hard Rock Hotel located right in Cancun's Hotel Zone. 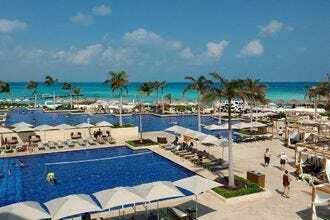 This sprawling, all-inclusive, mega-resort is situated on a wide beach with calm water just south of the Cancun airport. Each of the three sections, Nizuc, Sunrise and the newly renovated Grand offers pools, restaurants and activities. Guests can walk between the sections on the boardwalk along the beach or take the shuttle that runs constantly throughout the day. The kids and teen clubs are a huge bonus for families. Free phone calls to the US and fully-stocked guest rooms are nice perks. Room service is available 24 hours a day. Tasty food, special little touches and a friendly, helpful staff make Moon Palace a superb Cancun resort. Guests of Nizuc and Sunrise have access to both resorts but do not have access to The Grand, while guests of The Grand have access to Nizuc and Sunrise. 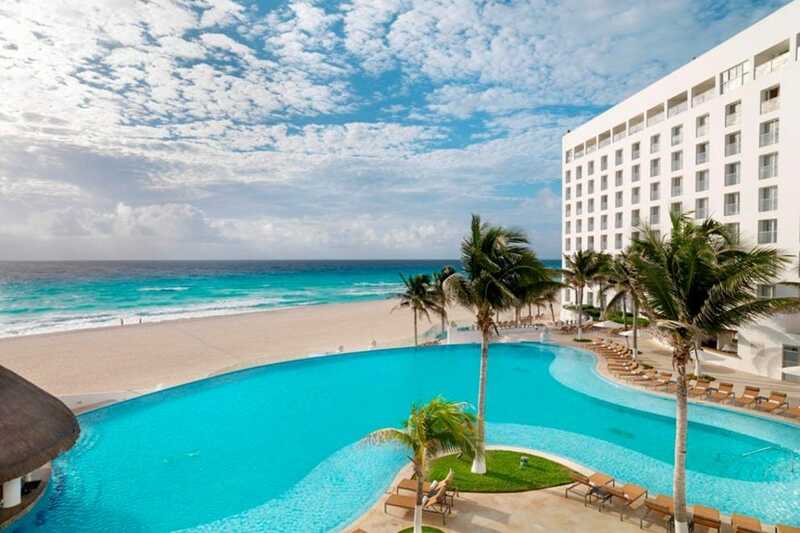 Hyatt hit the nail on the head when they chose the best location in Cancun's Hotel Zone. 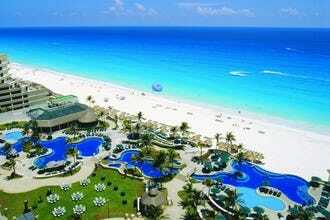 This all-inclusive resort sits on Punta Cancun (Cancun Point) where it is surrounded on three sides by the glorious Caribbean Sea. On each side there are calm, protected beaches, perfect for swimming, while in the center there are cliffs and open ocean. 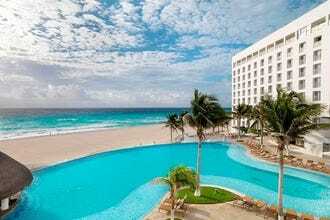 Hyatt Ziva Cancun boasts 6 different room categories, 8 restaurants, 3 lounges and 6 bars, including a microbrewery, sweets shop and coffee house. They also offer 24 hour room service. Guests can swim in one of the various pools, work-out in the gym, go kayaking or snorkeling, or participate in one of the many daily activities. Little guests can visit the kids club. Guest rooms are fully stocked and include a minibar with snacks. There is nightly entertainment. WiFi is free (and good) throughout the property. 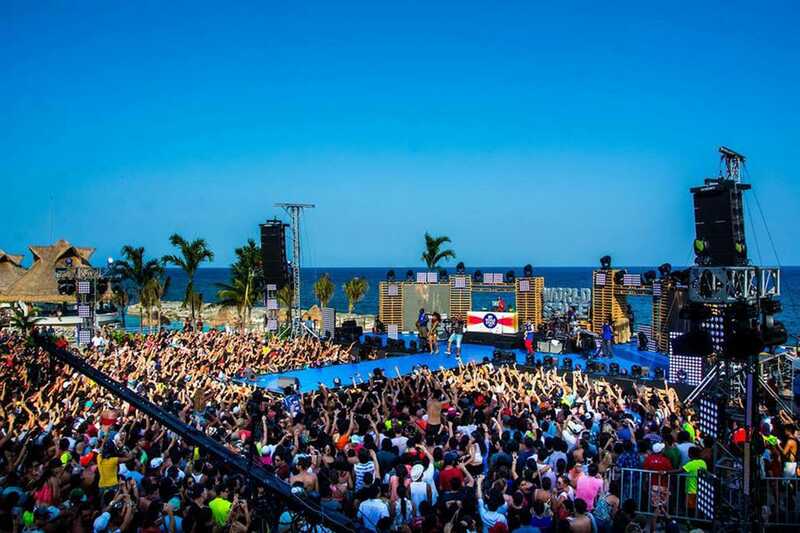 Grand Fiesta American Grand Coral Beach Cancun is located in the heart of Cancun's Hotel Zone, just steps away from the Party Center, on a calm, white sand beach with turquoise blue water. 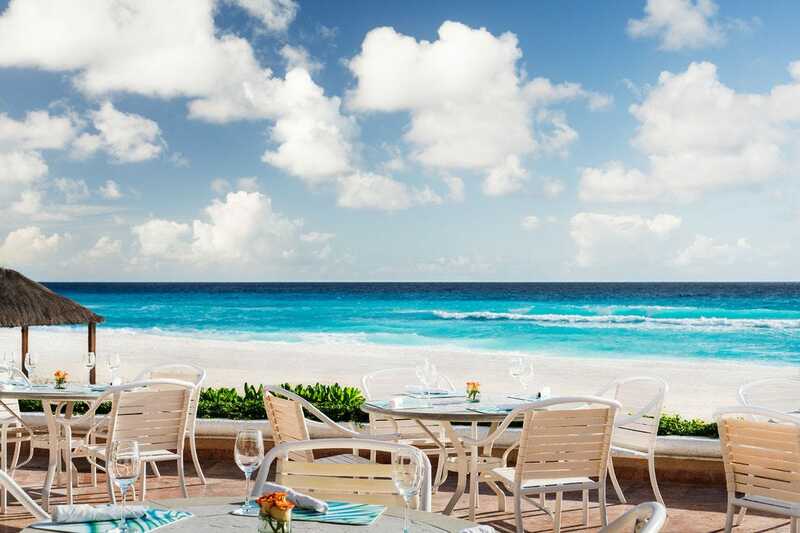 Grand Coral Beach is one of Cancun's largest, oldest and most prestigious hotels and is constantly improving in order to give guests the high level of comfort, elegance and service they have come to expect from this family-friendly resort. The pool is huge and the lobby, absolutely gorgeous. The cuisine served in the hotel's five restaurants (including AAA Five Diamond Le Basilic) is excellent and a step above what you will find in almost any all-inclusive resort. The property is also home to a ethereal world-class spa. 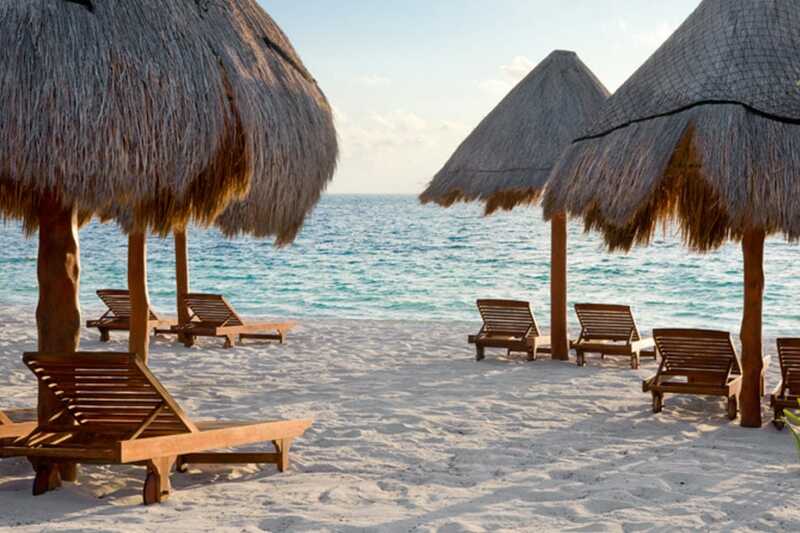 First class all the way, without that snobby feel, the Grand Fiesta American Grand Coral Beach Cancun never disappoints. 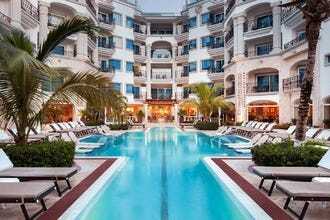 The Grand at Moon Palace Cancun, once the smaller, laid-back section of Moon Palace Cancun, has been expanded and completely redone, and is now the largest, most luxurious resort of the three. The Grand is home to 6 swimming pools, each with a different theme, countless bars, buffets, snack bars and a la carte restaurants, including Lebanese and Peruvian, endless daily and nightly activities and shows, a nightclub, and comfortable, fully-stocked guest rooms that in addition to the usual bells and whistles include a hot tub in the room, snacks in the minibar area, a liquor dispenser and a beach bag. Plus, no key cards to worry about, because your bracelet opens the door. This kids' paradise offers the unbelievable Playroom, with bumper cars, a mirror maze and so much more, a full water park and Wired, located off the main lobby, for arcade and video games. Guests of The Grand also have access to the Nizuc and Sunrise sections. The Grand at Moon Palace is all-inclusive vacationing at its very best. 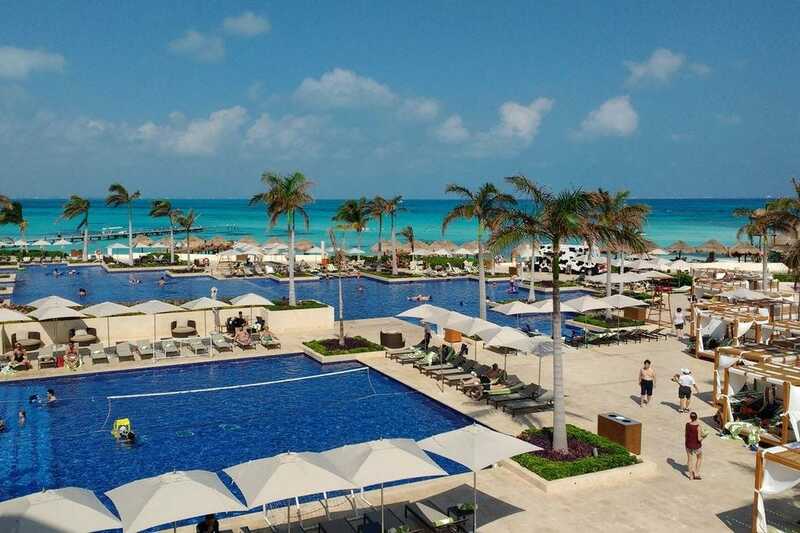 This chic, adults-only, all-inclusive resort is one of Cancun's most luxurious hotels. This opulent AAA Five Diamond property recently underwent a 30 million dollar renovation, and is better than ever. All-inclusive resorts are not generally known for offering quality cuisine, but that's definitely not the case in Le Blanc's 8 gourmet restaurants. Sophisticated, comfortable, fully-stocked guest suites and rooms offer butler service and have a view of either the sparkling Caribbean Sea or glistening Nichupte Lagoon. The hotel's award-winning spa is an otherworldly oasis and includes 19 treatment rooms and an incredible hydrotherapy facility. Le Blanc also offers space for corporate and social events, a full-service salon, a fitness center and activities like Aqua Body Strong fitness (stand up yoga), live music, karaoke, guided meditation classes, hatha yoga, TRX training, and Aqua spinning.